Vous pouvez cependant trouver eproduit a la fin de cette page l'introduction par Cantor Jay. J'adore ! 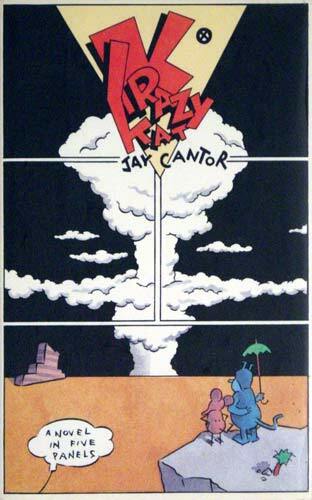 KRAZY KAT was the headliner of a comic strip - a long lyric delirium of love - that ran each day for thirty years in William Randolph Hearst's many newspapers. Against the desert backgrounds of Coconino County, a landscape that changed from moment to moment - mesas turning into trees into tumbleweeds - Krazy, too, transformed, being somedays he-cat, sometimes she. What didn't change was the plot: Daily & Sundays Krazy sang her aria of love and longing for IGNATZ MOUSE. And endlessly clever Ignatz, as if he spurned and despised the adoring Kat, spitefully delighted in hurling bricks at Krazy's bren. In her imagination - through Krazy alchemy - the brick-bruises bloomed as bouquets, proof to her of mousie's love. Lawman OFISSA BULL PUP, the Kat's steadfast admirer, arrested the abusive Mouse and marched him to the click. From which Ignatz escaped next morning to give our Kat her daily brick. Krazy's unexpected retirement has put the entire cast out of work: KWAKK WAKK, the gossipy duck who sang out Coconino's dirty linen, has no one to tattle on. JOE STORK, a lean decent creature who brought the babies and the mail from Outside, is a nearly dead letter man, for fickle fans no longer want to get in touch. DON KIYOTI, native-born long-eared snob, lacks an audience to lord it over. BEAU KOO JACK, the black rabbit of thumping paws, finds fancy trade falling off at his grocery store. KOLIN KELLEY, who fired the bricks that Ignatz threw, cleans and recleans his cold kiln, knowing that if Krazy never works again he is cursed king of useless rocks. And MRS. MICE, Ignatz's big-footed spouse, with MILTON, MARSHALL, and IRVING, her Joe-delivered progeny, bicker pointlessly, Dad out of work and time on their hands.